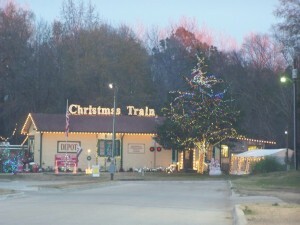 Experience a Texas Train Ride all decorated for the holiday’s right here in Jefferson, Texas. The historic train depot is decorated capturing the holiday spirit complete with Santa & Mrs. Claus waiting for the ultimate photo to take home. The wonderful narrated tour is accompanied by a local vocalist. The unforgettable ride aboard an old-fashioned steam train departs each Thursday, Friday, Saturday and Sunday, Thanksgiving through December 24. Enjoy lighted scenes along the Cypress Bayou River as you hear about the “Christmas Traditions around the Globe”. 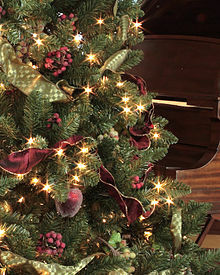 You’ll also have an opportunity to sing some favorite Christmas Carols as you create unique Christmas memories riding along the river. The 40-minute excursions will take you by a life-size nativity scene, the German Markets, Jerusalem and the Angel Tree. Glimpse Christmas trees simply decorated reminiscent of the bare-limbed sourwood of the Appalachian Christmas Tree to the opulence of a re-created 1885 Christmas tree in the Smith-McDowell House in Asheville, North Carolina. View scenes representing Alaska, San Francisco, Australia and the Arizona Hopi Indian nation. Ticket Prices: First Class $21; Coach Class: $14.75 – $16.50. Lap children under 3 are free. First Class is offered in a beautiful historic, heated, enclosed coach. If you are riding Coach Class, be sure to dress warmly and bring a blanket, as you will be riding in open cars. Seating is limited so purchase your tickets early. Also, ring in the New Year with the Rail of Lights New Year’s Train running on December 30 and 31. This ride will feature the dropping of the ball in Times Square, complete with beverages, noisemakers and a fantastic fireworks show on every train ride. Stay at our JeffersonTexas hotel alternative during the holidays. We’re only minutes to all the shopping, restaurants and attractions. This entry was posted in Holidays, Train Ride by Tammy D. Bookmark the permalink.